^ BUILD 2015 News: Visual Studio Code, Visual Studio 2015 RC, Team Foundation Server 2015 RC, Visual Studio 2013 Update 5. Microsoft. [2015-04-30]. ^ "New Release Preview:Visual Studio for Mac | Visual Studio", "Microsoft Corporation"
^ 4.0 4.1 Visual Studio Editions. TechNet. [2008-01-03]. ^ 针对 Visual Studio 的 Python 工具. www.visualstudio.com. [2016-08-09]. ^ System Requirements for Visual Studio .NET 2002. ^ O'Reilly Media - Technology Books, Tech Conferences, IT Courses, News. ^ 詳見Visual Studio 2008新功能 互联网档案馆的存檔，存档日期2008-01-29. ^ Gary Pretty. Visual Studio 2010 Beta 1 Finally Here. [2009年5月18日]. （原始内容存档于2009年6月15日）. ^ 14.0 14.1 14.2 14.3 14.4 Visual Studio 2010 Team System First Look. Microsoft. [2009年4月18日]. （原始内容存档于2009-04-17）. ^ Carlos Quintero. Visual Studio 2010 Extensibility moving beyond add-ins and packages. [2009年4月18日]. ^ F# to ship as part of Visual Studio 2010. [2008-12-10]. ^ Microosft details Oslo's modelling language, tools. SDTimes. [2009年4月19日]. （原始内容存档于2012年5月1日）. ^ Daniel Moth. Debugging Parallel applications with VS2010. [2008-04-18]. ^ More support for parallelism in the next version of Visual Studio. MSDN. [2009年4月23日]. ^ 21.0 21.1 21.2 21.3 S. Somasegar. 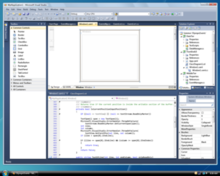 Code Focussed Development in VS 2010. [2009年4月18日]. ^ 'Visual Studio Team System Rosario'. [2008-04-05]. ^ Microsoft Unveils Next Version of Visual Studio and .NET Framework. Microsoft PressPass. [2009-08-14]. （原始内容存档于2009-08-15）. ^ Doing Architecture with Team System Rosario. [2009-04-18]. ^ Visual Studio 2010 Architecture Edition. [2009-04-18]. ^ Historical Debugger and Test Impact Analysis in Visual Studio Team System 2010. Channel9. [2009-04-18]. ^ Habib Heydarian. What’s new in Visual Studio Team System 2010: Episode 2. [2008-04-18]. ^ Visual Studio 2010 Lab Management. [2009-04-18]. ^ Ina Fried. Visual Studio 2010 to come with 'black box'. CNET News. CBS Interactive Inc. [2009-04-18]. ^ S. Somasegar. 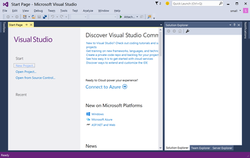 Visual Studio 2013 Launch: Announcing Visual Studio Online. MSDN Blogs. [2014-01-23]. ^ Visual Studio 2013 Update 1. Visual Studio site. Microsoft Corporation. 20 January 2014 [23 January 2014]. ^ Visual Studio 2013 Update 1. Somasegar’s blog. Microsoft Corporation. 20 January 2014 [23 January 2014]. ^ Visual Studio 2013 Update 2 RTM. Visual Studio site. Microsoft Corporation. 12 May 2014 [12 July 2014]. ^ Description of Visual Studio 2013 Update 3. Microsoft Corporation. August 15, 2014 [18 August 2014]. ^ Visual Studio Community 2013. Microsoft Corporation. 12 Nov 2014. ^ ColinBeales from Microsoft Visual Studio UK Team："Visual Studio 2013 - Enhanced Scrollbar"
^ Montgomery, John. Visual Studio “14” CTP now available. The Visual Studio Blog. 3 Jun 2014 [18 August 2014]. ^ Montgomery, John. Visual Studio “14” CTP 2 Available. The Visual Studio Blog. 8 Jul 2014 [18 August 2014]. ^ Montgomery, John. Visual Studio “14” CTP 3 Released. Visual Studio Blog. August 18, 2014 [18 August 2014]. ^ Montgomery, John. 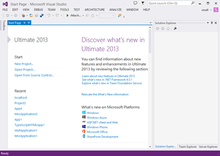 Visual Studio 2015 Preview, Visual Studio Community 2013, Visual Studio 2013 Update 4, and More. Visual Studio Blog. Microsoft. 12 November 2014 [2015-01-15]. ^ Visual Studio Release Notes - Visual Studio.